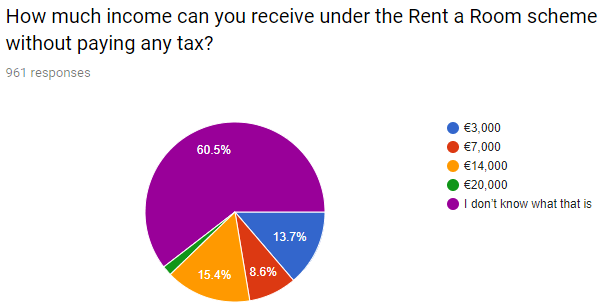 Anyone who has rented in Ireland knows that it can be painstakingly hard to find somewhere affordable that isn’t decrepit or overcrowded, particularly in Dublin… So why not lend a hand in the midst of a rental crisis while making a decent income… tax free! Whether you’re already a home-owner with a spare room, you’re renting a house with additional living space or you’re in the position to buy, you could be making additional income by letting out a room in your home. In December 2018, Daft.ie published their quarterly sales report. The report stated that while there is significant growth in the availability of houses for sale, the rental sector is at a record low and “continues to worsen”. The fact is there’s way too much demand and not enough supply, which means there are lots of opportunities for would-be landlords. Did you know that you could be renting out a room in your home and earning €14,000 a year tax free with the rent-a-room scheme? If you’ve never heard of the scheme, don’t worry, you’re not alone. A recent survey conducted by Taxback.com showed that 60.5% of people have never heard of the rent-a-room relief. What exactly is the rent-a-room scheme (RAR)? In a nutshell, it allows you to rent out one or multiple rooms or a self-contained living space such as an attic, a basement flat or a converted garage to one or more tenants and receive that income tax free. Well, as long as the income amounts to no more than €14,000. To qualify for the relief, your home must be located in the State. You must live in the house and it must be your sole residence during the year of assessment. No exceptions. You don’t have to own the property, you can sublet it but you must be given consent from your landlord. You can’t deduct expenses from your rental income while claiming rent-a-room relief. However, if you qualify for the relief, the income you receive from renting out the room is not liable to PRSI, USC or income tax but you must file a tax return to declare your rental income. You cannot rent the room to a partner or your children nor an employee or employer. You can rent out one or multiple rooms as long as the total income from these rooms combined, is below the €14,000 mark. All of the rent money you receive from tenants must cover their bills. You must declare the income you make from renting a room. Once you exceed the €14,000 mark by even one euro, you will be taxed on the full amount so the rent (including bills) for all rooms and tenants cannot exceed a yearly income of €14,000. When you’re declaring your rental income, you can check if you’ve overpaid as far back as 4 years. You should know that short-term rentals do not qualify for the relief. In fact, in October 2018, Airbnb was cut from the rent-a-room relief. This is after Minister for Finance, Paschal Donohoe pushed for exclusion of short term rentals and tourism rentals from the scheme. But what exactly is a “short term” rental and what kind of circumstances might affect whether you qualify for the scheme. In a 2018 Tax and Duty manual, Revenue defines a short-term letting as all or part of a house, apartment or other similar establishment to a tourist, holidaymaker or other visitor for a period which does not exceed or is unlikely to exceed 8 consecutive weeks. So for example, if you rent the room out to a student who leaves each weekend, you qualify. And if you then rent the room out to other people during the weekend, you are not covered. The person renting the room must be planning on staying long-term. You cannot claim reliefs on a room that is used for business purposes or short-term stays provided through any of the following: a bed and breakfast, a guesthouse or an online booking site. Want to claim your rent-a-room scheme refund? Tom bought a new house in March 2015 for occupation as his main residence. As his mortgage repayments were extremely high, he decided to let the spare room in his house. He received rental income of €11,000 in 2018. He also received €1,500 for providing meals to his tenant. Tom’s gross income from renting out the room and providing this service was €12,500. This amount exceeds the limit for 2015 (€12,000) therefore he is not entitled to the rent-a-room relief for that year. During Budget 2016, the maximum income was increased for the rent-a-room scheme from €12,000 to €14,000. If you are claiming back as far as 4 years, it’s important to check what the limit was for the correct tax year. Sarah is renting a house that is her sole residence. During 2018, she sub-let a room, with permission from her landlord. Her tenant paid her gross rent of €15,000. While the room was sublet, Sarah spent €1,500 on repairs to the room following water damage. In this scenario, Sarah is not entitled to rent-a-room relief for 2018 because her gross income from letting the room exceeds the €14,000 limit. The expenses of €1,500 cannot be taken into account for the exemption limit purposes. The amount of taxable income is €13,500 (€14,000 less €1,500 expenses) – assuming there are no other allowable expenses. Jim wants to buy a property worth €220,000. The house has three bedrooms, two of which will be spare. If the average rent per room in his area is €250, he would be earning around €500 a month. That means Jim could potentially earn around €6,000 a year, tax-free. If his mortgage is €745 per month, that means he could own the property for €245 per month. The money could also be used for something like home renovations or ‘overpaying’ his mortgage which would ultimately save him tens of thousands in the long run. You might have heard the term “accidental landlord” before… or you might even be one! The term means someone who didn’t buy a property with the intention to let it out but is forced to do so because of personal circumstances. Usually a need for extra income. Unlike professional landlords who make a living leasing out houses, accidental landlords are much less official and often aren’t protected by the same landlord-tenant laws. Accidental landlords often lack familiarity with things like business and tax returns but the fact is, you’re a landlord, accidental or not, and that comes with certain responsibilities and obligations. These obligations include declaring and paying income tax. If you’re renting a room out or subletting, you must pay tax, but I bet it’s a relief to know that you won’t have to pay any tax if your rental income doesn’t exceed the €14,000 mark. Again, when you qualify for rent-a-room, you’re not obligated to register as a landlord with the Private Residential Tenancies Board (PRTB) and you’re not bound to the various obligations of professional landlords. While this has its upside it can also leave you vulnerable. Renting out a room in your home is a nice way for you to earn money tax free and to make a difference to someone looking for a home just remember that you should always try to legally protect yourself if you’re trying out a venture like this. You are not covered by landlord-tenant law so take the proper precautions. Create a written contract that includes information on things like; rent costs, what is and is not included, if there is a deposit required and how much it is, whether your tenants need to give notice if they’re leaving and how much notice they must give. All of these things will help protect you if at any point you need to go to small claims court over a disagreement with a tenant. If you’re a landlord (or an accidental landlord) why not contact Taxback.com today, we will answer all of your tax-related questions and we can walk you through everything you need to know about getting a tax refund under the rent-a-room relief. After graduating with a BA in Creative and Cultural Industries, I worked as a freelance content creator and blogger, that is before joining the Taxback.com team! When I'm not busy writing, I can be found enjoying the company of my four pugs or blogging about horror movies and podcasts.